Will Surface, Microsoft’s tablet, appear to be a game changer? Did Microsoft (on purpose) order too little of them? Who will tell. But fact is that online orders are being backordered for 1-3 weeks. On Friday the Microsoft Stores will have limited amounts of the Surface available, how many is unclear. It looks like I will have to queue in front of the Microsoft Store in Chicago to take one home. For sure not everybody seems to agree with my statement that Windows 8 together with the Windows Surface tablet and the tablets of other producers might mean Microsoft’s return to the group of technology leaders. But for sure this is what Microsoft is hoping for and Steve Ballmer bets on. Watching the video below you might understand why Ballmer thinks like that, because it looks really promising. 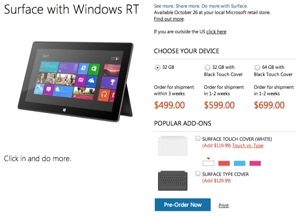 The fact the Surface already seems to be sold-out doesn’t tell us too much yet. We just don’t know how many were ordered by Microsoft. But anyhow it’s a promising indicator. For sure Windows 8 won’t kill Microsoft like Forbes’ title insinuated. It won’t kill Microsoft, thanks to the fact Microsoft still earns a huge amount of money from software licenses. On the other hand it’s not realistic to believe Windows 8 will become a success from day 1. It will take time before huge amounts of users will switch. People will wait for devices that fulfil their needs and meet their budget. The last one might appear to be a problem. The new devices that have been announced are not cheap, which indicates the producers are aiming on the more high-end business market. This higher price level will probably slow down the adoption of Windows 8. Besides, it might stimulate people to think about other possibilities, although they will be less integrated with the entire MS Office environment. Personally, I really like Windows 8. For some people it will be a major change. On the other hand, for first time tablet users it might feel naturally from the start. I would love to touch both a Surface and another touch enabled Windows 8 device. If it feels good I will try to buy one. Unfortunately, it looks like I will have to queue at night to see and feel a real Surface.